Heavy scent. 3 to 4 Feet. Late August / Early September flowering. 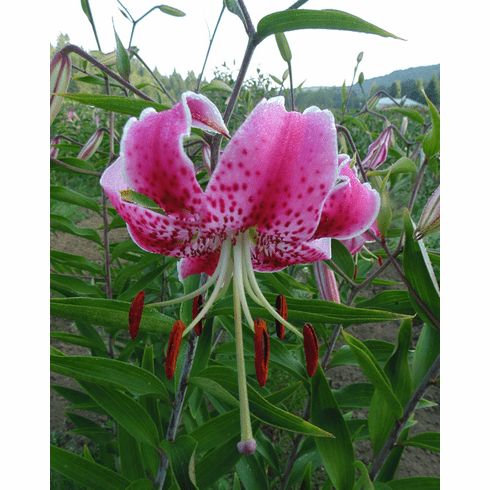 (Wild Lily Native of Japan) Brilliant, dark pink, recurved petals with white trim and light speckles; hardy throughout USA in full sun or partial shade. Easy to grow, treat the same as any Oriental Hybrid lily. Light fragrance. 3 to 4 Feet. Late August / Early September Bloom in the Pacific Northwest. Bulb Size - This is a species (wild) lily, that is nursery cultivated. While all bulbs are flowering size, having all flowered the season before harvest, they will never make the larger sizes commonly found in hybrid stock. Historical Note: In the early part of the 20th Century, Rubrum lilies were so prolific in Japan, they grew wild throughout the country. 1925 to 1935 highlighted this golden age for the Japanese lily enthusiasts. Hirotaka Uchida was one of Japan's most proficient farmers of that time. A large exporter of lily bulbs, Hirotaka's personal pursuit involved the cultivation of exceptional Rubrum lilies. From his fields, he selected out lilies bearing the most beautiful flowers that also showed the greatest resistance to disease. These were transplanted to a special field where he and his eldest son, Machao, watched over them. When World War II began, many orchards were turned in to potato fields. Although flower fields were politically "discouraged", Hirotaka and Masao had such an affection for the special clones they had been cultivating, that while other flowers disappeared from cultivation, their lily efforts continued. They chose 13 of their finest clones, and as they cared for the superior lilies, little by little, their quantities increased. After the war, the longed for export of lily bulbs finally resumed. In 1949, the Uchidas exported the first 60 bulbs of their crowning achievement: a lightly-fragrant, beautiful rose-crimson, spotted Rubrum which had shown exceptional hardiness. By 1950, the not yet named 'Uchida' had received wide recognition for its resistance to virus. Six years later, it was officially registered as Lilium speciosum rubrum var. 'Uchida', in recognition of its cultivators. A gold medal was awarded to it in 1963 at the prestigious Internationalle Gartenbau Ausstellung in Hamburg, Germany. Few flowers with such graceful beauty and delicate fragrance can boast the extreme hardiness of 'Uchida'. Now over 60 years old, this popular Rubrum has established itself as a true "heirloom lily", a showpiece lily to delight the senses and to pass on in ever-increasing numbers from generation to generation. A special thanks to the Ofuna Botanical Garden, Japan for the historical information provided.